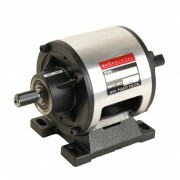 Electromagnetic Clutch Brake units are made by Miki Pulley in Japan. We carry a range of these units on the shelf. Clutch Brake units use a combination of Electromagnetic clutches and Brakes all assembled in a light alloy housing. The unit may have a split shaft with one import and one output or a solid shaft, or it may have a split shaft with multiply input and output points.